A year after the release of hardware v4.1, the HeaterMeter team (me!) is proud to announce the release of hardware version 4.2. v4.2 builds on the successful v4.1 platform and offers several improvements. Integrated low-pass filters on all probe inputs for unparalleled temperature reporting accuracy. Thermocouple pit probe support - For those willing to try their hand at surface-mount soldering, the pit probe can be hardware configured to use a thermocouple. Thermocouples can survive higher temperatures (some over 1000C), react faster to temperature changes, can be cheaper, and are available in a variety of configurations. Any K-type thermocouple is supported. 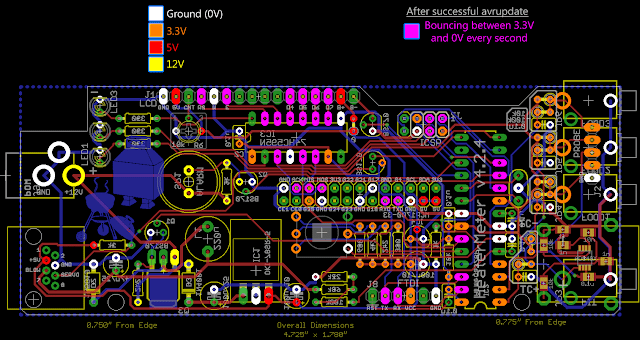 Reorganized board significantly reduces electrical noise over v4.1 and eliminates the need for "white wire" fixes and other board modifications to achieve acceptable probe performance. Completely eliminates the issue where HeaterMeter would enter lid detect mode within a few seconds of the blower turning on. RF input has been removed from the main board. For lmremote or IT+ reception, a secondary rfaddon board must also be built. Servo pulse voltage now boosted to ~4.7V (was 3.3V) which may improve drive over longer cables. TruVolt(tm) blower output - Integrated step-down voltage converter produces smooth voltage output for driving the blower 5V-12V rather than PWM. This provides more precise control of air flow, especially at lower output percentages. More compact overall design. Thinner than a cup of coffee! Wait, that's not a good comparison, but the encased v4.2 is only 29mm thick. Everything you do will be faster and more fun. Information is on the wiki and everything is available on github. 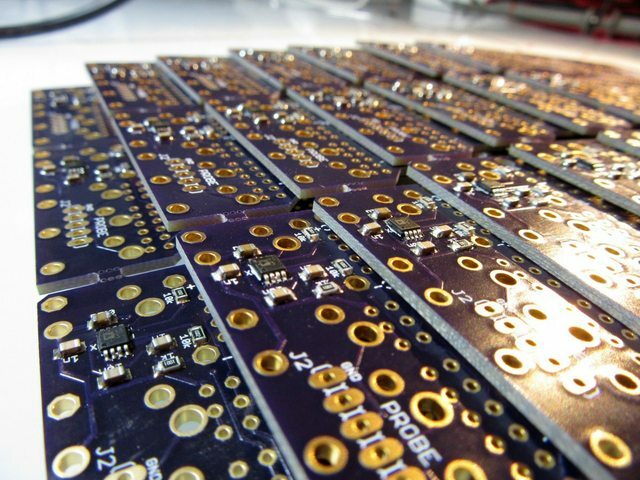 The OSH Park Store will be offering single v4.2.4 PCBs within the week (although they won't be in stock for about 10 days). Some of the features of the new hardware require require the latest AVR firmware 20140630B which works best with LinkMeter firmware v11. Thanks to all the hardware testers and 3d modelers for providing feedback, testing, and 4.2 cases which will be published soon: Ralph Trimble, Tom Kole, John Bostwick, and Matt Miller. I also have small quantities of PCBs with the thermocouple components pre-soldered and tested available on in the HeaterMeter store for $44. A full kit of the HeaterMeter hardware is also available. I've gotten permission from the moderators to post a link to it here, thanks Chris! Last edited by Bryan Mayland; 12-27-2014 at 02:44 PM. Sweet... Cant wait to build the 4.2 I am currently on a 4.0 board.... Thanks again Bryan for all the hard work!! All the mouser links default to the German mouser site. de.mouser.com but maybe its just me can anyone verify that? Last edited by Lesley M; 07-14-2014 at 09:55 AM. It's just you. If you've gone to de.mouser.com (such as from a part link on one of the threads here), mouser will redirect you to de. * always. You need to click the German flag on the top right of the page then select U.S. again. Thanks Bryan, That was the first time I have ever been owned by a cookie. Last edited by RalphTrimble; 07-15-2014 at 02:53 PM. I'm also doing a trial run of producing 30x HeaterMeter PCBs with the thermocouple amps pre-installed so no surface mount soldering is necessary. The boards should be back from the fab and shipped to me later this week. Cost shipped in padded envelope with USPS tracking is probably going to be in the $40-50 ballpark. Last edited by Bryan Mayland; 07-14-2014 at 12:51 PM. Is that per board to have the smd components already installed?